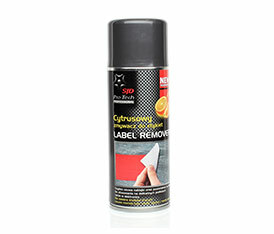 Product for rapid removal of stickers, self-adhesive labels and adhesive residue, tar and asphalt. Citrus Cleaner removes the toughest stains on surfaces soiled by oil, grease, fats, coal dust, spots of tar, asphalt and adhesive residues. It does not contain corrosive. For use on glass, metal, laminates, ceramics, painted surfaces, rubber and wood. Shake well before use. Spray the product on cleaninng surface. Wait few minuts until the active citrus oils minimalise atachment of glue. Remove the dirt with the cloth. When it’s necessary you can use water to clean the rest of dirt. Try it before use in invisible place. Tt does not react with 99,9 tested surfaces.